MBSB's share price have been trading quite erratically. After reporting a better quarter to quarter, will this stock climb higher? Looking at these erratic prices just gives me a headache. But we can still try and analyze it and see what technical developments might happen. I will begin examining MBSB by taking a look at the monthly chart and then zooming into the daily chart. That way, we can make more sense of the big picture in MBSB. The chart above is the monthly chart of MBSB. As you can see, the stock is far from its former glory. Every bull run is being led by certain stocks but in this bull run, MBSB is no longer the king but the laggard. You will also be able to see how MBSB has moved from a monthly Stage 1 to Stage 4. In other words, it has formed a complete cycle from boom to bust. At this moment it is just trying to get out of a Stage 1 basing to move to a stage 2 uptrend. If MBSB can form a monthly cup with handle, then it is possible for it to move to 2.00. But always remember that this is a monthly chart. So it might take a long time. The chart above is the weekly chart of MBSB. First of all, I want to bring your attention to the layers of resistance in this chart. The layers of resistance represents people who lost money in this stock. If someone had bought this stock in the past, do you think they will sell or keep the stock when MBSB reaches that place? The answer to this lies in human psychology. They have lost a lot of money in the past and when they get the chance to sell their stocks near their purchase price, they will sell. This causes a lot of supply that needs to be absorbed. So far, the recent bullish run in 2017 has only managed to absorb the supply around 1.40. You still have lots and lots of layers of resistance that needs to be absorbed. That is why if you hope that this stock will fly up very fast like other stocks that have no resistance, you will be met with disappointment. Even if it rises it will take a lot of time for it to overcome the layers of resistance. There is at least something good that we can see in the weekly stock chart. 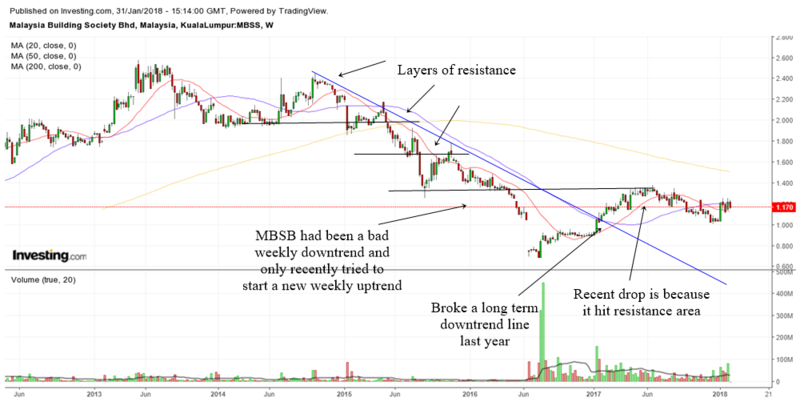 MBSB has broken above a weekly downtrend line. This is an indication that it wants to start a new weekly uptrend. 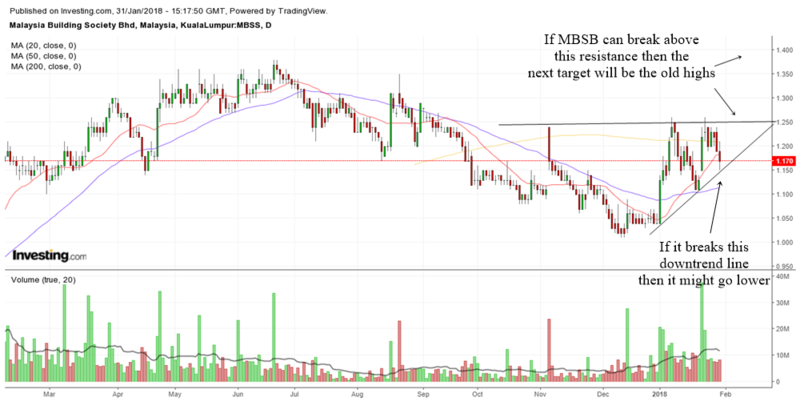 Last of all, let us have a look at the daily chart of MBSB. I have drawn two trend lines to help us gauge where it wants to go. The first one is the horizontal line which kinds of act as a resistance to this stock at the moment. If MBSB can go above this horizontal line, it is possible for it to go to the old highs near 1.35. The second line is the uptrend line that connects the higher lows in the stock. The fact that the stock is making higher lows is encouraging. But you want to be careful if it drops below this uptrend line. If it breaks this line, the stock might just go lower. 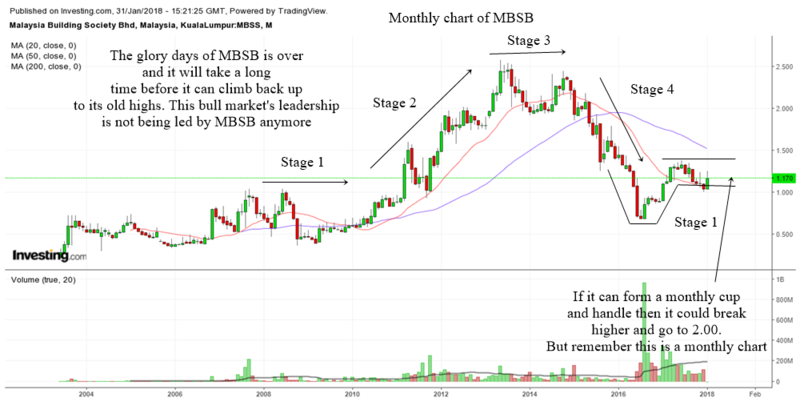 Looking at the construction of the monthly, weekly and daily chart of MBSB, this is a stock for very patient investors. Since there are lots of layers of resistance you really need a lot of patience to wait for them to be overcome. If you have not bought this stock then it would be better to find another nice trending up stock to invest. If you are already invested in it, perhaps you might want to consider greener pastures elsewhere.